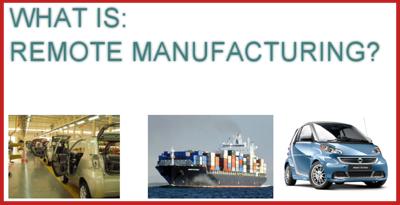 VIDEO - WHAT IS REMOTE MANUFACTURING? When designing and manufacturing it is usual to carry out these functions in the same place. For instance, for many decades the car manufacturing industry in the UK designed and manufactured cars on the same site. Today it is common to have designers in one country sending their designs across the world to another country where manufacturing takes place. This is part of what is known as the global economy. Often it is cheaper to manufacture products in the Far East, in countries such as China whilst designing in Europe or the USA. A typical example is seen below. The book publishing industry in the UK has seen a shift in its printing (manufacturing) from Europe to Hong Kong or Korea. However, the layout design and content of books remains in the UK. The book seen below is written by its author in Manchester. The book title is ‘English Castles and Fortifications’. Although this is a book for a limited market , it makes sense to write and complete all the layout and planning in the UK. Then all the details and information can be sent electronically to the printing works in Hong Kong. It is cheaper to print in the Far East and then transport the books back to the UK for sale. This called remote manufacturing. Multiple copies of the first edition are printed. The first batch numbers five thousand. It may be necessary to print more batches if sales go well back in the UK. 1. Describe another industry that relies on remote manufacturing. Explain the stages of design and manufacture. 2. Explain the advantages and disadvantages of Remote Manufacturing.